An early indication that advances were needed in forging technology came during World War II, when examination of captured German planes revealed large forgings - forgings much larger than those possible under Allied manufacturing methods. 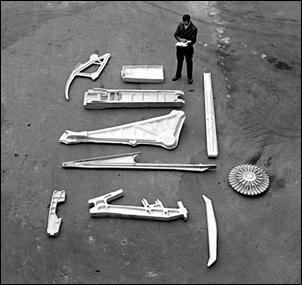 These forgings from the German aircraft were made of magnesium, a material one-third lighter than aluminium, but a difficult substance to work with. 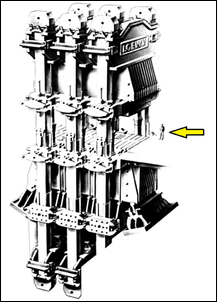 Under the impact of heavy hammers, magnesium tended to rupture; it became apparent that the Germans (who suffered from a shortage of aluminium) made their magnesium forgings with presses larger than any previously thought practical. The War Production Board took a strong interest in development of similar facilities in the United States. In 1944, it was determined that an 18,000-ton closed-die hydraulic press would be built in North Grafton, Massachusetts. The Mesta Machine Co. of Pittsburgh was contracted to build the press. Wyman-Gordon Company, which had specialized in forgings since its beginning in 1883, was selected to operate the plant. Wyman-Gordon’s new plant, located about five miles away from the main offices in Worcester, was built on a tract of land known as the Bonny Brook Farm. The project was not completed when World War II ended, but work went on; the aircraft industry, it was decided, needed at least one heavy press to continue to carry out research into large forgings. The Grafton plant was finished in 1946, built completely around the 18,000-ton press, at that time the largest press ever built in the US. But in Germany, much larger presses had been in operation. This was discovered by a team of experts who went into Germany in the summer of 1945, virtually on the heels of the Allied advance. As had been suspected because of the forgings found in captured aircraft, the Germans had been operating enormous presses: one was a 33,000-ton press, then the largest in the world. This press was claimed by the Soviet Union. The United States was able to dismantle two other 16,500-ton presses and ship them to the US. The Germans, incidentally, had not been able to complete the crowning achievement of their forging program - a 55,000-ton press. It was reported that the plans for that press fell into the hands of the Soviets. In the U.S., two factors soon pushed heavy press production into new realms. First was the growing interest in supersonic aviation: the jet engine and airplane required large components of tremendous strength, but at a minimum of weight. And the rumblings of the Korean War increased interest in development and production of aircraft. The outgrowth of the need for larger, stronger aircraft parts was the Air Force Heavy Press Program. Air Force Lt. Gen. K. B. Wolfe, one of the team which had visited post-war Germany to inspect the presses, was the originator and prime motivator of the program. The final placements under the plan called for two 50,000-ton presses, one at Wyman-Gordon’s Grafton plant and the other at Alcoa’s plant in Cleveland. Alcoa and Wyman-Gordon would each also gain a 35,000-ton unit under the program. Ground-breaking for the expanded United States Air Force facility in North Grafton took place in 1951. The building, designed to accommodate the 35,000- and 50,000-ton presses, contained more than 730 railroad cars of reinforcing and structural steel; enough concrete to build 33 miles of highway; a production floor which covers six city blocks. Upon completion, the expanded plant was self-contained: it had its own engineering and die-sinking departments. Both the 35,000- and 50,000-ton machines were designed and built by the Loewy Construction Company. 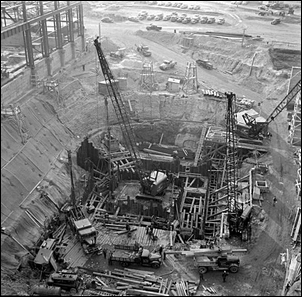 Operation of the 35,000-ton heavy press began at the North Grafton plant in February of 1955. The 50,000-ton press began turning out forgings in October of that year. Foundations go 100 feet into bedrock, which was believed to be the deepest excavation for a machine ever made in the United States. Elevators run from the pits to the working floor of the shop. Standing ten stories high, the 50,000-ton press is somewhat reminiscent of an iceberg, in that 48 feet are above the shop floor and capable of exerting a pressure of 106 million pounds. The holding platens - which could comfortably accommodate four parked cars – handle dies weighing up to 50 tons per pair. There are 25,000 individual parts to the press, some of which are among the most massive items ever moved by ship and train. After four years of construction, the machine swung smoothly into operation. The first part forged was a landing gear support rib for a Lockheed Super Star Constellation. The part was superb; the 50,000-ton press had worked perfectly, the first time it was used, and there were no significant adjustments or changes needed. The Heavy Press Program confirmed that the closed-die forging technique was practical and economical. 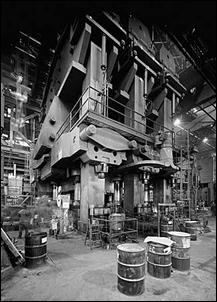 Heavy presses made it possible to forge extremely large, and complex pieces, parts essential to modern aircraft design. 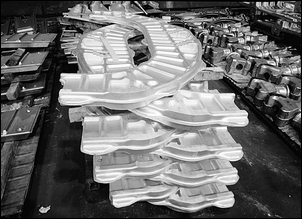 The equipment also allowed manufacture of large components with exceptionally close tolerances and reduced drafts. Much less machining was required, and the physical properties of the final product were superior. These advantages continue. Ironically, physical properties of the forgings were further increased by abandoning magnesium - the metal which prompted development of the heavy press program in the first place - in favour of alloys of aluminium. It was found that two aluminium alloys were better for the process. 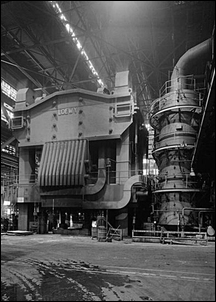 These alloys, though, were eventually replaced by others, and today the Wyman-Gordon heavy presses forge a variety of alloys, stainless steels, refractory metals and titanium. The 50,000-ton press has had a significant role in this forging evolution. One of the most dramatic illustrations was in the early 1960's during the development of a new jetliner, the Boeing 747. When bids were solicited for a massive support beam for the main landing gear system, only Wyman-Gordon was able to meet the challenge - perhaps the most difficult production challenge in the company's history. Engineers wanted a forged beam that would save weight and eliminate the need for many assembled components. 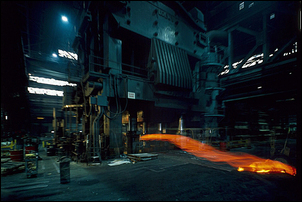 Using a procedure developed during work on the SST project, Wyman-Gordon produced the largest closed-die titanium forging made anywhere in the world. The beam measured 20 feet long by four feet across. It weighed over 4,000 pounds. Since then, over 2,000 have been produced without a rejection. The use of titanium and other sophisticated metals, and the 50,000-ton press, continues today. Still the largest fabrication tool of its type in the United States, the press regularly turns out airframe and structural components in a variety of shapes and sizes, including fuselage bulkheads, wing spars and rotor hubs for helicopters. In 1951, Lt. Gen. K. B. Wolfe foresaw the possibilities. “The Heavy Press Program,” he said, “will revolutionize plane making.” It has. *The 50,000 ton press is an American Society of Mechanical Engineers (ASME) International Historic Engineering Landmark. The text of this story appears by agreement of the ASME.